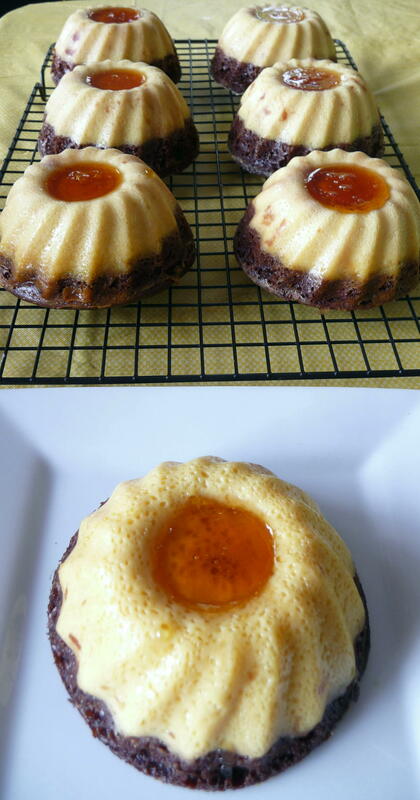 The fun part is that the flan layer sinks while the cake layer rises, reversing positions while baking. This is the impossible aspect, though I like “magical” better here. As with most buttermilk based-baking, the cake has a delicate crumb and is very moist. In contrast to the cakey layer, the flan is a very rich counterpart, and the caramel or cajeta or my hard candy topping will complement both layers. Caramelized syrup for the cakes - probably at hard-ball stage. The “hard candy” was a strange by-product of my experimentation. I tried to add a flan-syrup, from Rick Bayless, Authentic Mexican: Regional Cooking from the Heart of Mexico (which I would say is the one Mexican cookbook to have it you could have only one – how sad would that limitation be, if one had to choose?). Perhaps I should not suggest that you do this, as I did, after the cake-flan has baked and is cooling. The caramel "hard-candy" disc provides textural and flavour contrast. I made the beautifully deep amber syrup and then poured it on the cooling individual magical-mystical-Mexican cakes. 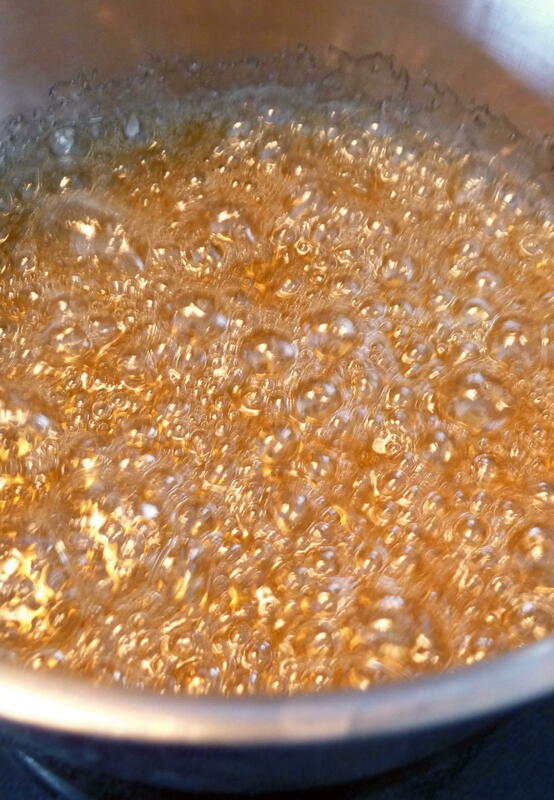 Not being a big candy-maker, I did not realize that I probably reached hard-ball stage, which meant the syrupy-pool on top hardened into a crunchy disk, as the syrup began to set up pretty quickly. It was kind of fun as a decorative option, and our friends liked it. Yet it was not traditional (flan is typically baked on top of this syrup, which probably keeps it from hardening – my theory). Rick suggests cajeta, below. 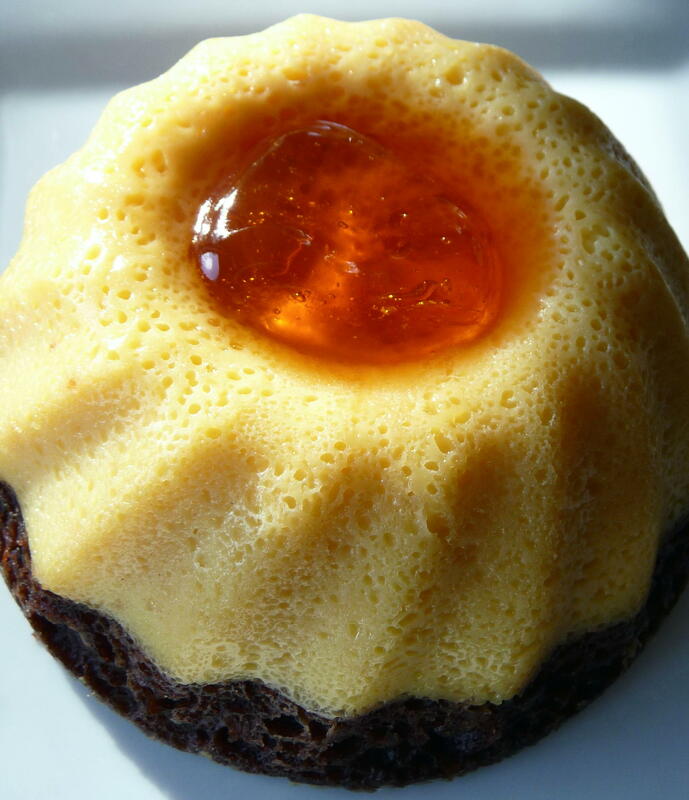 You can find easily a recipe for flan syrup or let me know, if you want mine, for the hard candy version. Krissy and Daniel’s version of the mini-variety is a good option, and the recipe below can be used in a single Bundt cake pan (35-40 minutes baking time). One option is to go with Rick’s original flan recipe (one more egg and delete the cream cheese), which I might try next time for a more traditional, perhaps less rich, flan. However you top it, the Impossible Spicy Mexican Hot Chocolate Flan-Cake is quite possible to make successfully and impossible to beat. Prepare the mold. Turn on the oven to 375 degrees and position the rack in the middle. 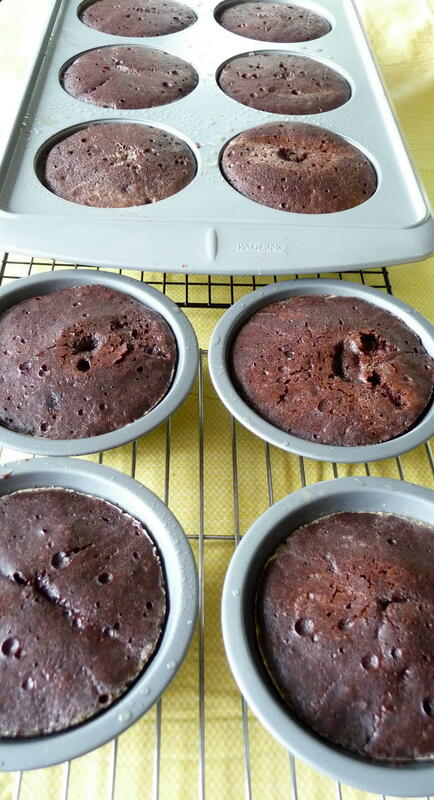 Generously butter (NB: I used cooking spray oil) the bottom and sides of 10 one cup individual bundt cake pans, sprinkle with flour, tip the pans, tapping on the side of the counter several times, to evenly distribute the flour over the bottom and sides,then shake out the excess. Microwave the cajeta for 30 seconds to soften it, then pour over the bottom of the pan, tilting the pan to coat the bottom evenly. Set a kettle of water over medium-low heat. Set out a deep pan that’s larger than your cake pan (a roasting pan works well) that can serve as a water bath during baking. Make the cake batter. With an electric mixer (use the flat beater, if yours has a choice), beat the butter and sugar at medium-high speed until light in color and texture. Scrape the bowl. Beat in the egg and espresso. Sift together the all-purpose and cake flour, baking powder, baking soda, cinnamon, cayenne, and cocoa. With the mixer on medium-low, beat in about ½ of the flour mixture, followed by ½ of the buttermilk. Repeat. Scrape the bowl, then raise the speed to medium-high and beat for 1 minute. Make the flan mixture. In a blender (I used a food processor), combine the two milks, the eggs, cream cheese, and the vanilla. Blend until smooth, for about a minute or two. Layer and bake. 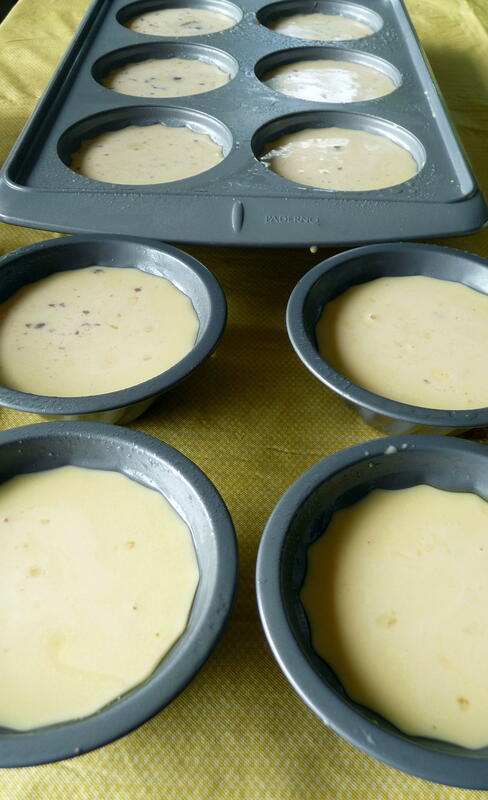 Evenly scrape the cake batter into the prepared cake pans and spread level. Slowly, pour the flan mixture over the cake batter. (I used an ice-cream scoop, to make it even). Pull out the oven rack, set the cake pans into the large pan, then set both pans on the rack. Pour hot water around the cake to a depth of 1 inch. Carefully slide the pans into the oven, and bake about 20 to 25 minutes, until a toothpick inserted into the cake comes out dry. Remove from the water bath and cool to room temperature, about 1 hour. Carefully run a thin-bladed knife around the edge of the cake/flan to free the edges. Invert a wire cooling rack (larger than the individual bundt cake moulds) over the cake pan, grasp them tightly together, then flip the two over. Gently jiggle the pan back and forth several times to insure that the cake/flan has dropped, then remove the pan. Scrape any remaining cajeta from the mold onto the cake. This entry was posted in Baking, Cakes, Dessert, Recipes Misc and tagged Bundt, Cake, Chocoflan, Chocolate, Flan, Mexican, Spicy. Bookmark the permalink. Thanks and you’re welcome, Krissy. I think Rick Bayless is right about using store-bought cajeta to make it easy! I found your post helpful, too, when making it. Beautiful, I’d love to line them up and eat them one by one until they’re all gone! Thanks very much, Roxan. It was nice of you to stop by. Simply beautiful – although I know a lot of work to make. Thanks, Annmarie. I appreciate your compliment. It was relatively easy (with the mixer and food processor) but took a bit of time – not too bad! Hey Dan, these look awesome! I really like the idea of this and would go off on one if it was in front of me right now (smile). I made your chocoflan for my Spanish class over the summer, and everyone loved it!! I’m also making it again for Thanksgiving tomorrow. 😀 Thanks for sharing this amazing recipe!! Chimichangas and burritos are not a mexican, you can go anywhere in mexico and you will not find either, Mexican cuisine is much more extense, rich and full of complex flavors beyond just tacos and tostadas. I tried this recipe tonight, I have one question. 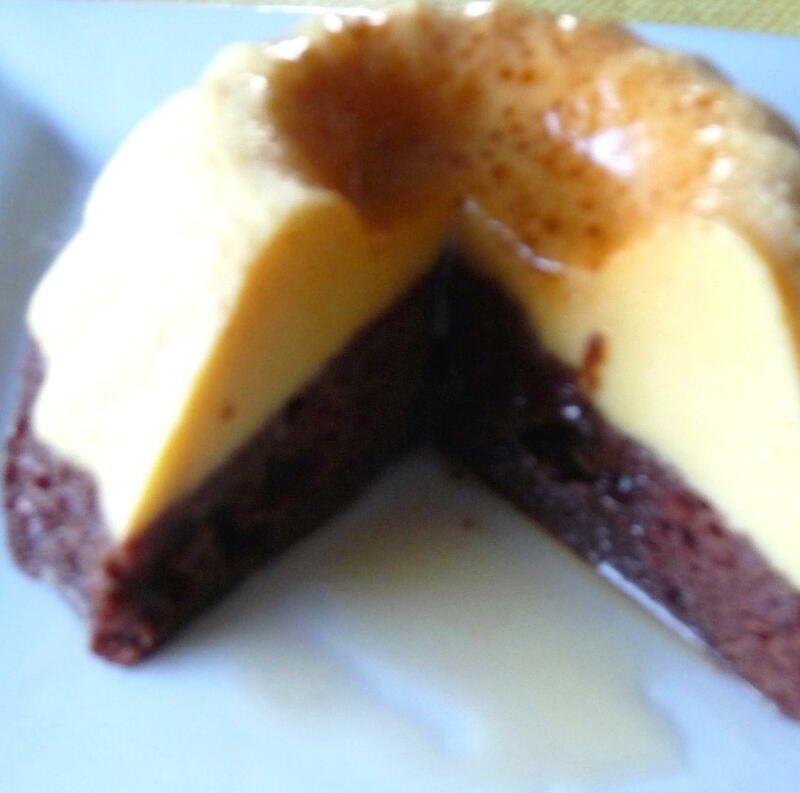 My mini chocoflans had brown (i’m assuming cake ) around areas of the top flan. Not that it was a deal breaker because they were so scrumptious, but whats your secret on getting your flan to come out so perfectly? I already make a big bundt pan, but always overloaded. 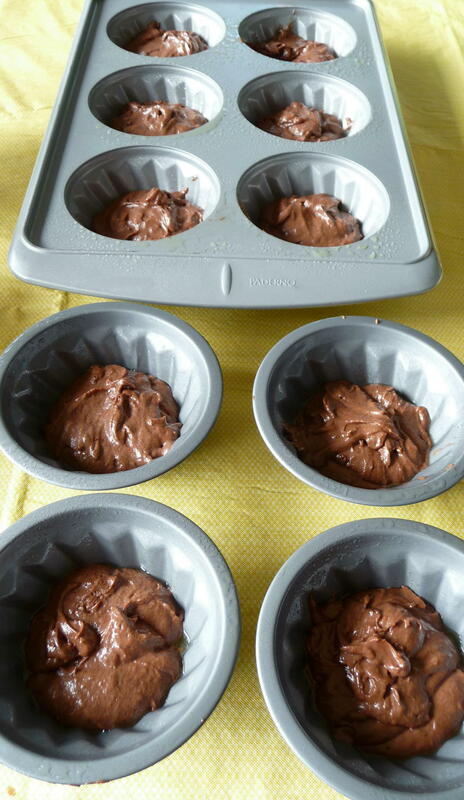 So I figured, why not leave an entire inch off the top unfull and make 6 mini bundt cake chocoflan. I followed your instructions on the time. I sincerely applaud you and will add cinnamon to my recipe next time.